For some homeowners who are considering the installation of a heated driveway, discovering the initial price of a snow melting system can be like getting hit in the face by an errant snowball. The immediate response is to retreat to the garage and embrace the snow shovel with renewed, yet reluctant affection and appreciation. Unaware of the many custom – and affordable – driveway heating options that can accommodate a vast range of budgets and layouts, many consumers unknowingly close the door of possibility and relegate themselves (and their families) to a future of manual snow removal. 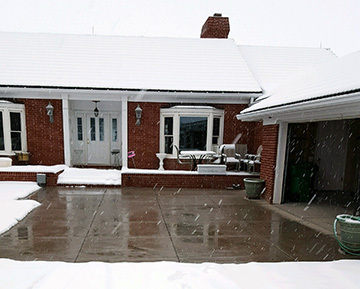 A heated driveway system in concrete operating during a snowstorm. In truth, no two heated driveways are alike, as every system is customized according to the specific demands of the homeowner. Each system is not only designed for the specific layout of each driveway, but other factors are considered as well. In addition to the budget, driveway heating systems are also designed according to ASHRAE standards. The American Society of Heating, Refrigerating and Air-Conditioning Engineers (ASHRAE) is an organization committed to advancing the arts and sciences of heating, ventilating, air conditioning and refrigerating to serve humanity and promote a sustainable world. Snow melting system requirements vary, depending on the specifics of the project. ASHRAE standards were established to address variances such as the location’s altitude, average snowfall and temperature, etc., to allow designers to optimize each system’s performance for that particular location. Basically, if you want the best snow melting system, it’s a good idea to choose a radiant heat solutions provider that adheres to ASHRAE Standards. To ensure the best snow melting system for your needs, it’s vital that your radiant heat provider design a custom system in accordance with ASHRAE Standards. This ensures that every system best meets the specific needs of each customer. Adhering to these standards means breaking down the design of the system regionally. This entails careful research of the weather for the region, including the general climate, average snowfall, storm duration, temperatures, and other important factors to ensure that the system’s components and design is going to be best suited to perform ideally in that particular location. While the price of a heated driveway can often be rationalized by the added convenience and time-saving features – or money saved from paying for manual snow removal – perhaps the real benefit of a heated driveway is added safety. “It’s a classic example of how you can’t put a price tag on peace of mind,” says Alex Geier, of Hinsdale, Illinois (quoted by the Calgary Herald). Safety is likely the single greatest benefit of a heated driveway system. You also don’t have to heat the entire driveway. Many choose to only heat an 8-foot wide strip up the middle of a driveway, or two 24-inch tire tracks. The options and custom layouts are endless, and so many things can be done to accommodate the budget – without affecting performance. Snow melting systems can be further customized to accommodate the available power. And don’t worry. You don’t need to be solely responsible for determining the available power of your home. Ultimately it is the electrician who determines this. However, there are some helpful guidelines that may assist you as you work with radiant heat professionals to determine the best snow melting solution. If you have limited power there are still options that would allow you to install a heated driveway. 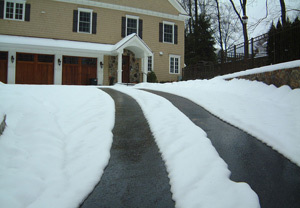 Customers with minimal power have installed heated driveways that rely on zoning. This means that only one section of the driveway heats up at a time. For example, if there are three zones, then zone one will first activate. After it clears the area, zone two will then power up, followed by zone three. Certainly this is not as ideal as heating a driveway all at once, but for those with power constraints, this is a viable option. Regardless of your situation and budget, chances are that there is a custom driveway heating solution that will fit your needs. Call Warmzone for more information (888.488.9276), or visit us online at www.warmzone.com.